Have you ever wondered if you could go into business and make a profit? Well, you can, you just need a good idea. What do I mean by that? In order to be profitable in any business, you must offer something that people want to buy. You have two choices: either you can market a product, or you can market a service. A good example of that is when you were young, you may have had a lemonade stand in front of your house, so when cars went by, they could stop and buy your lemonade. That would have been a product that you were offering. Or, you might have shoveled snow for neighbors when it snowed. That would have been a service that you were offering. It is no different today. You simply need to find a need in your area - a need being what people want in the way of a product or a service. Perhaps it's a delivery service for the elderly. You could offer to deliver mail to the post office for them, or packages to the post office on holidays. That may not be very profitable, though. You could offer to do grocery shopping for the elderly, but that too would have its limitations, due to time constraints. How about becoming a virtual assistant for local businesses? That would amount to working from your home, and becoming a secretary/all-around assistant for local businesses. That is, in a way, a process that one can use to come up with ideas. 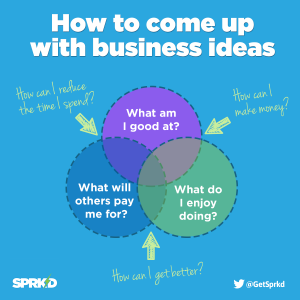 Run one idea through the mill, and see how it looks. Look at the plusses and the minuses. Potential profit is the bottom line, and as you can see, the first two ideas failed the test, but the third passed with flying colors, simply because being a secretary/virtual assistant for businesses multiplies your time, and could therefore turn out to be very profitable. Of course, you will need a dedicated telephone, a computer and printer, and a fax/scanner - and then you are in business. The secret of becoming successful in business is to find something that you can do that fits your skills and abilities. How good are you at learning new things? Can you quickly acquire the knowledge and skills to do something new? There are many people who sell merchandise at flea markets. There are many market settings that have sprung up all over the country where an indoor space can be rented, and if you have products that people are looking for, you can do well. Most are only open a few days a week, but if the foot traffic is large enough, that might be all you need. Do you have any special skills or training that you could turn into a business? If you are good at putting events together, you might consider becoming an event planner. Weddings, business meetings, class reunions, are all events that, for the most part, people are hesitant to take the lead for in getting everything arranged. You could do that for a fee. Look around your town. Get a listing of local businesses and see what is lacking. Your future business is only an idea away.